In 2015, CIRC reached out to the coastal community of Grays Harbor County, Washington. CIRC's goal: to see if we could help the community become more resilient in the face of climate change-driven coastal hazards, including rising sea levels and the flooding and erosion associated with it. The result was the Grays Harbor County Coastal Futures project. The project involved nearly three years of work with the Grays Harbor community. Together with CIRC, the community formed a knowledge-to-action network (KTAN), a team made of local Grays Harbor stakeholders and CIRC scientists and outreach specialists. Using a powerful computer model called ENVISION, the Grays Harbor KTAN collaboratively developed the information and tools necessary to help the Grays Harbor community assess the potential impacts of climate-driven coastal hazards the community faces. To help the community plan for these hazards, the KTAN also evaluated a range of adaptation strategies designed to help the community become more resilient. And because cost is a major factor in any adaptation effort, the KTAN also developed an economic analysis of the potential costs of different adaptation strategies. The project held its last stakeholder meeting in April 2018. The final phase of the project is expected to reach completion in the summer of 2018. Helped build the knowledge necessary for Grays Harbor County decision-makers to prepare for and mitigate coastal hazards connected to climate variability and change. Developed, refined, and applied a landscape change model designed to assess the risk of coastal flooding and erosion that combined a number of factors. 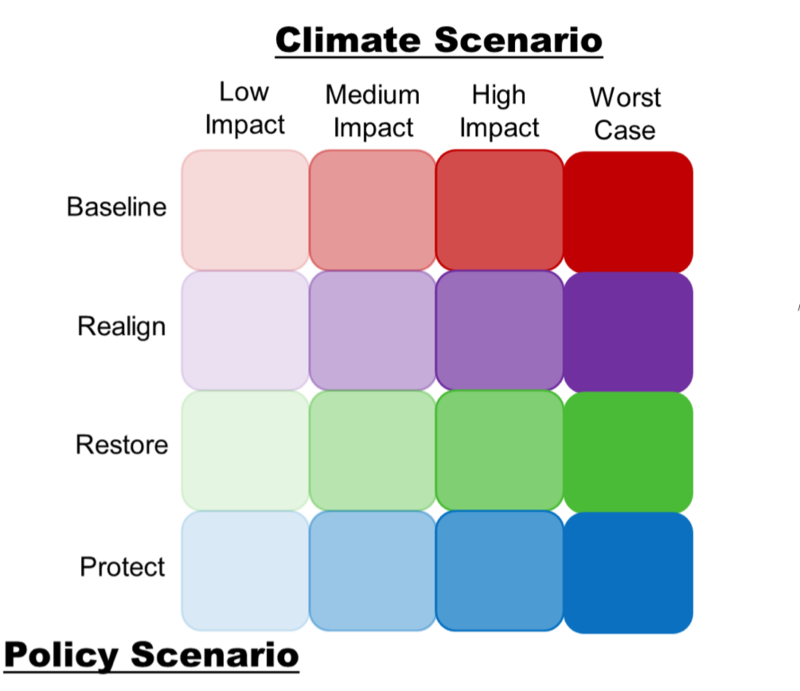 Developed and evaluated policy scenarios identified by the the knowledge-to-action network. During the Grays Harbor Coastal Futures project, the research team presented a series of findings around coastal hazards—including sea level rise, flooding, erosion, and increased storminess from El Niño events—that are likely to affect the Grays Harbor community throughout to year 2100. The community in conjunction with the CIRC team was then asked to brainstorm how they might respond to these hazards given future population and infrastructure growth. 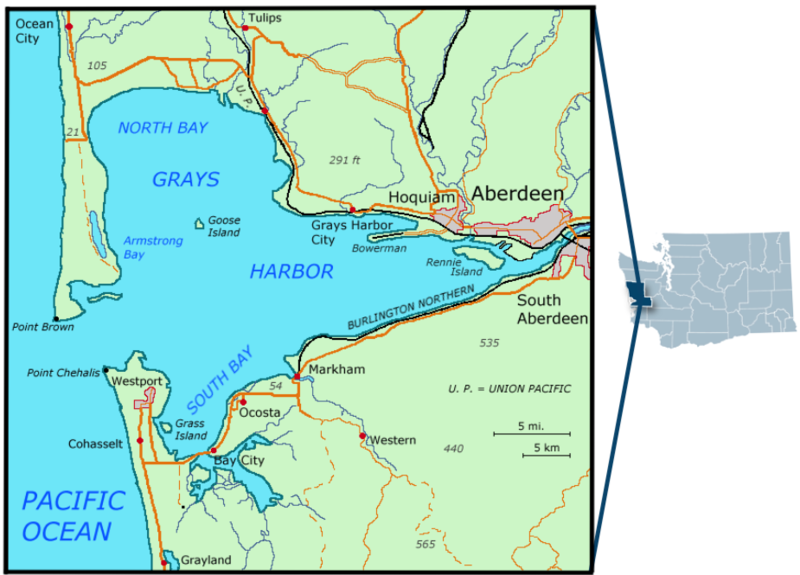 As a result the project developed a series of alternative future scenarios for the Grays Harbor coastline and bay that combined climate scenarios and their likely coastal impacts with policy scenarios designed to ameliorate the worst effects of those impacts. These scenarios capture stakeholder input on possible strategies for managing the coastline in the future. They "package" sets of policy choices that are intended to achieve specific goals. 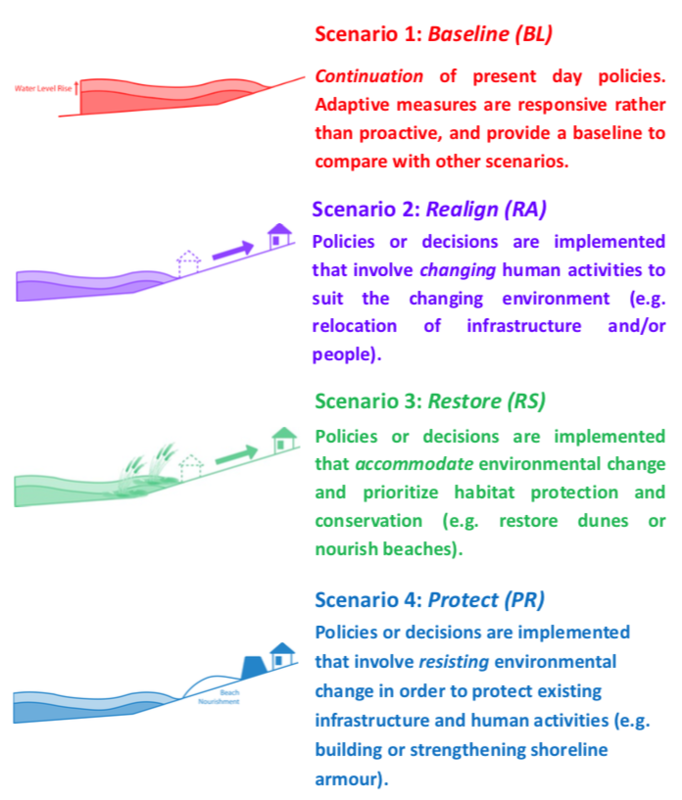 For example, the Protect Scenario focuses on a set of strategies for protecting existing and new building/infrastructure from future damage by hardening the coastline and protecting structures in their current locations, whereas the Realign Scenario emphasizes strategies that move buildings and infrastructure out of harms way. Climate change modeling isn’t about predicting a single monolithic future. There’s too much uncertainty and human societies are too complicated and unpredictable for that. But while the future is unwritten, climate and social science can tell us a great deal about the likely futures (plural) we face. This is why CIRC’s goal in Grays Harbor and elsewhere has been to give communities the ability to visualize the many probable paths that lie ahead of them. We call these futures and alternative future scenarios. In Grays Harbor that means aiding local community members as they envision how drivers of change—from rising sea levels and growing seaside storms to population shifts—will affect their futures. To explore these futures in more detail, check out the Grays Harbor Coastal Futures Explorer. Figure 1: Regional sea level rise estimates for the Pacific Northwest developed by University of Washington’s Climate Impact Group1. Estimates were developed probabilistically with inclusion of local vertical land motions. 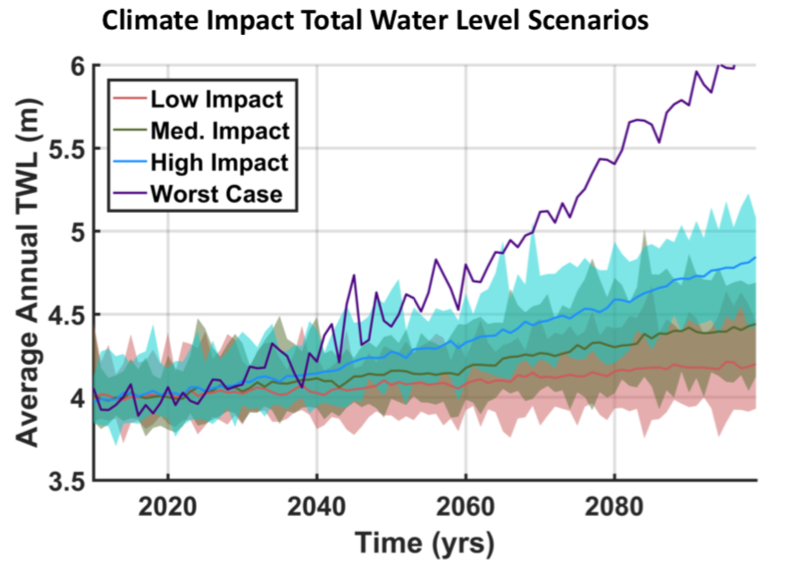 Figure 2: Example total water level climate impact scenarios where the dark line represents the SLR projection and the shading represents climate variability. A combined threat of rising sea levels, intensifying waves, and major El Niño and La Niña events has led to increased flooding and erosion hazards along the Pacific Northwest coast. As part of the Grays Harbor Coastal Futures project and the related Tillamook County Coastal Futures project, CIRC graduate students Heather Baron and Katherine (Katy) Serafin along with CIRC researcher Peter Ruggiero honed our team’s ability to model this combination of threats using the concept of total water levels (TWLs) achieved at the beach. TWLs combine factors—including projected sea level rise with increasing wave heights, projected changes in El Niño and La Niña events, the shape of local coastlines, and calculations of the tides—to determine by how much our coastal communities are likely to be inundated by the Pacific Ocean in the decades ahead. For instance, the Pacific Northwest coastline is likely to experience a rise in local sea levels from a couple of inches to roughly 1.5 meters (5 feet) by the year 2100. However, we can also expect significant differences in the extent of the inundation from location to location due to the elevation of a location’s backshore and any climate adaptation measures adopted by coastal communities, among other factors. What’s more, El Niño events and large tidal events, which temporarily raise local sea levels, can also play major roles. The combination of these factors dictates how high TWL exceeds relevant thresholds for flooding and erosion impacts. Erosion—A general term applied to the wearing away and movement of earth materials, in this case sand and sediment, by gravity, wind, water, and ice. Coproduction is collaboration between experts and stakeholders—people and organizations with a stake in a given issue. Backshore Protection Structure (BPS)—A structure, such as a rock revetment, built to control erosion by armoring the dune face. These structures dissipate wave energy and prevent further recession of the backshore. Dune Restoration Project (DRP)—A constructed dune that is built to be a natural barrier to the destructive forces of waves and high water levels, and to help control erosion and damage to inland structures. DRPs are examples of natural or nature-based (green) infrastructure. Flooding—An overflow of water onto lands that are normally above sea level. Flooding can be produced by storm surge, sea level rise, and the effects of climatological phenomena such as the El Niño Southern Oscillation (ENSO). Knowledge-to-Action Network: A team made of stakeholders, scientists, and outreach specialists. Coproduction— a collaboration between experts and stakeholders—people and organizations with a stake in a given issue. Maintenance (DRP or BPS)—Rebuilds structures that are currently insufficient to perform their intended function (e.g. overtopping). Of note, Envi- sion currently does not model degradation of structures over time. Nourishment—Sand placed on the beach profile to counteract the effect of shoreline erosion and maintain beach accessibility. In Envision sand is only placed in front of structures (BPS or DRP). Scenario Narratives—Scenarios do not predict future changes, but describe future potential conditions in a manner that supports decision-making under conditions of uncertainty. Scenarios are used to develop and test decisions under a range of plausible futures. 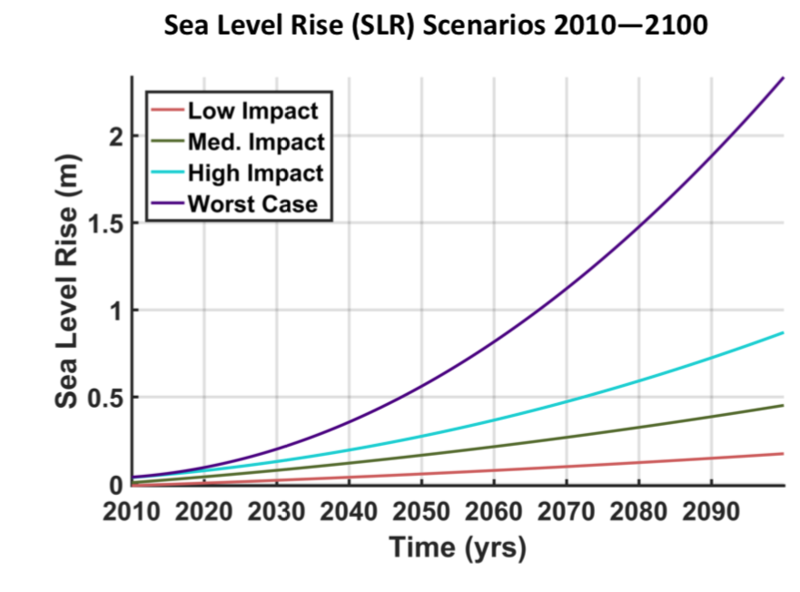 Sea Level Rise (SLR)—Increases in the height of mean sea surface elevation. In this application, SLR will take regional factors (e.g., vertical land mo- tions, ocean dynamics, cryosphere, and fingerprinting effects) affecting sea level in Washington into account. Total Water Level (TWL)—The combination of the water level (tides and non-tidal residuals) with waves. In Washington, the wave-induced compo- nent can account for as much as 60% of the elevation of the total water level.